This is a Sunday Double Back puzzle, with a twist. This is actually a “Triple Back” puzzle. You must visit each room exactly three times. As you can see, I am a fan of the Legend of Zelda series. I wish they’d make them a bit more challenging though. Now I am going to do some venting (isn’t that what blogs are for?). Some time Friday night, not very late, I decided to run through some of the puzzles I had queued up. And sure enough in this one I found some errors. So I proceeded to fix them. This broke other things, so I fixed those. This goes on and on… for SIX #$%*)#ING HOURS! It is now Saturday, 2:10am in the morning as I write this. I am flying back home from college for winter break today, and I have to get to the shuttle at 6:45am. I have not started packing, or putting stuff away, or printing my itinerary, or unplugging stuff. Or, most importantly, sleeping. This puzzle had to be fixed now though, because I’ll be on planes for all of Saturday. I hope to whatever higher powers there are that all the bugs in this puzzle have been, in fact, given gruesome deaths. This entry was posted on December 20, 2009 at 5:00 am and is filed under Double Back, Extra Variation,  Sunday. You can follow any responses to this entry through the RSS 2.0 feed. You can leave a response, or trackback from your own site. I haven’t completed the puzzle yet, so no comment on that. Flush with the thrill of victory after 272, I’m stepping back through the scattered Double Backs I hadn’t gotten to.. With 192, either I was more competent with the recent practice, or the puzzle was a tad easier (or both), but it was rewarding all the same. 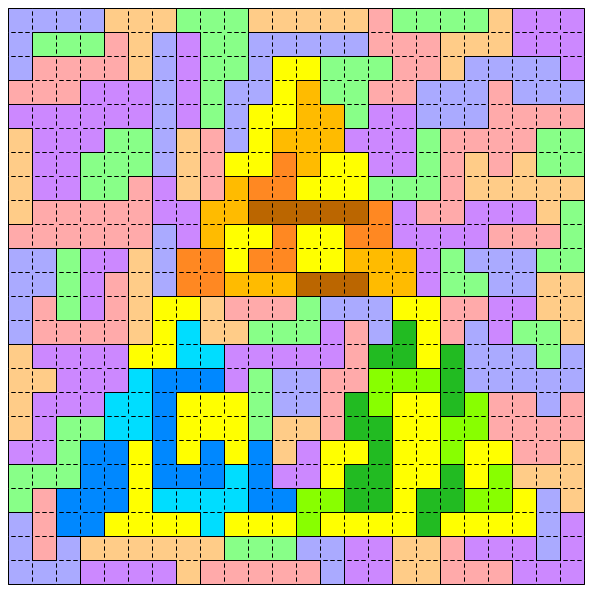 Great puzzle here, both the interesting variation and the rule-appropriate design. (Wind Waker is my pick for Best Of) Really liking the Double Back type with its interesting techniques and variations, and the pictorial designs put an elegant bow on top. Thanks!